'Historical item of exceptional sentimental value' expected to be sold for hundreds of thousands of shekels. The legendary silver-played kiddush cup that the Lubavitcher Rebbe used at Shabbat and holiday meals will be put up for auction. At the close of the Rosh Hashanah, Simchat Torah, Passover and Shavuot holidays, the Rebbe would recite the Havdala prayer over the cup of wine that had been used for Birkat HaMazon (grace after meals) following the holiday meal. After drinking most of the wine, the Rebbe would stand for hours pouring wine from his cup into small glasses held by his chassidim as they filed before him. The Rebbe would bless each participant, young and old, with "Life and blessings", while his glowing countenance enhanced the words. 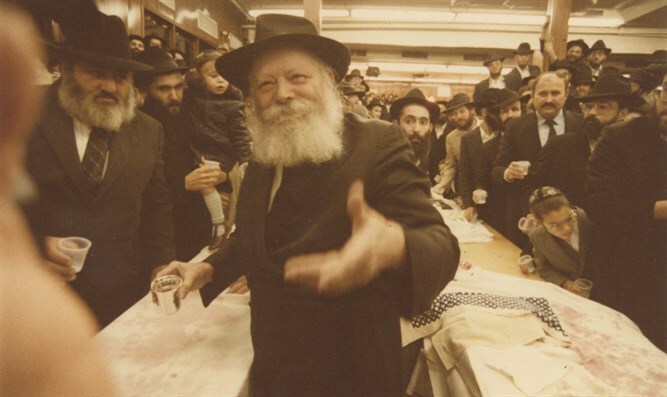 The Rebbe would stand on his feet for hours on end distributing wine and blessings, often until close to dawn (this custom remained unchanged until the Rebbe was almost 90 years old). The Rebbe would pause upon occasion to wave on and encourage the singing crowd, while his face glowed with joy. This ceremony was known as the "cup of blessing". Many miraculous tales have been told about personal salvations that came about through the Rebbe’s blessings during the "cup of blessing" ceremony. From time to time, the Rebbe would stop pouring the wine and excited the audience with vigorous movements in happy songs with both hands, his face radiant and shining with joy. Many stories are told about people who were saved from the Rebbe's blessings on this occasion. The Kedem auction house holds a certificate from one of the Rebbe's relatives, indicating that the Rebbe's cup be put up for sale for a period of time. Maron Aran, one of the owners of the Kedem Auction House, notes that "this is a historical item of exceptional sentimental value that has been handed over to us. The chalice is a sign and a symbol of the great merit of those who were enveloped in the aura of the Lubavitcher Rebbe, and of the great abundance of people he influenced in the Jewish nation."